The citizens of Fort Wayne, Indiana really do love their former Mayor Harry Baals, and they're about to have the most awesomely named public facility in the history of all time. Last week, hackers operating under the Anonymous banner broke into servers for HBGary, a security firm whose COO, Aaron Barr had declared his intention to reveal the identities of key people operating as Anonymous. A group calling itself the FLA, Food Liberation Army, have apparently kidnapped a Ronald McDonald Burger chain figure and have a list of demands they wish to be met by Megacorp. "We are the Food Liberation Army, and we hope that this extreme action will take us towards a better and safer food future. Two days ago we kidnapped Ronald McDonald from a McDonald’s Restaurant. If you do not answer all the questions we will execute Ronald on Friday February 11, 2011 at 6:30PM EET." Tickets for SDCC sold out on Ticket Leap within 24 hours. Even though the site was using Amazon's web servers to help cope with the huge demand it consistently showed a 'momentarily Unavailable' screen. Through the persistence of button pushing hopeful attendees refreshing their browsers throughout the process, they had 33 Million hits and completely sold out of all tickets within a day! "Very early this morning surfer Maker Visser rode 30-40 foot giant waves in Maui in complete darkness lit only by LED lights built into his life vest and surfboard while helicopters hovered overhead filming the event. " Funnyman Seth Rogen was left stunned by a recent encounter with his moviemaking hero George Lucas — because the Star Wars director spent 20 minutes telling him the world would end in 2012. Rogen was left speechless when Lucas and Steven Spielberg joined a movie meeting he was a part of – but the encounter has left him worried his life will be over next year. He recalls, “George Lucas sits down and seriously proceeds to talk for around 25 minutes about how he thinks the world is gonna end in the year 2012, like, for real. He thinks it. THE next time you gaze deep into someone's eyes, you might be shocked at what you see: tiny circuits ringing their irises, their pupils dancing with pinpricks of light. These smart contact lenses aren't intended to improve vision. Instead, they will monitor blood sugar levels in people with diabetes or look for signs of glaucoma. The lenses could also map images directly onto the field of view, creating head-up displays for the ultimate augmented reality experience, without wearing glasses or a headset. The moment the "net neutrality" debate began was the moment the net neutrality debate was lost. For once the fate of a network - its fairness, its rule set, its capacity for social or economic reformation - is in the hands of policymakers and the corporations funding them - that network loses its power to effect change. The mere fact that lawmakers and lobbyists now control the future of the net should be enough to turn us elsewhere. Of course the Internet was never truly free, bottom-up, decentralized, or chaotic. Yes, it may have been designed with many nodes and redundancies for it to withstand a nuclear attack, but it has always been absolutely controlled by central authorities. From its Domain Name Servers to its IP addresses, the Internet depends on highly centralized mechanisms to send our packets from one place to another. The ease with which a Senator can make a phone call to have a website such as Wikileaks yanked from the net mirrors the ease with which an entire top-level domain, like say .ir, can be excised. And no, even if some smart people jot down the numeric ip addresses of the websites they want to see before the names are yanked, offending addresses can still be blocked by any number of cooperating government and corporate trunks, relays, and ISPs. That's why ministers in China finally concluded (in cables released by Wikileaks, no less) that the Internet was "no threat." 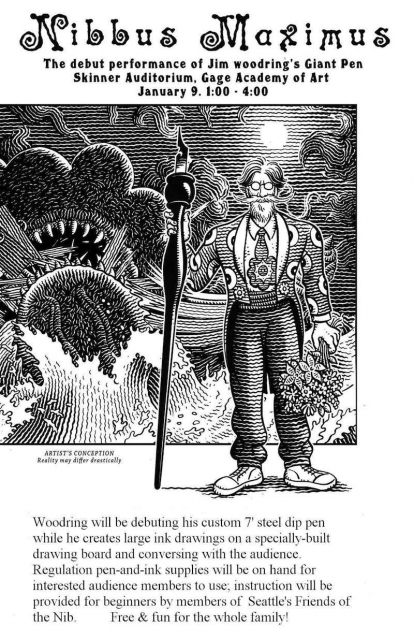 Jim Woodring will perform with his giant ink pen, in Seattle, on Jan 9th.